Bright yellow buttercups bring to mind summer days and sunny meadows, so it’s not surprising that they represent cheerfulness, charm and the innocence of childhood. Who hasn’t played the childhood game of holding a buttercup under a playmate’s chin to find out, by the yellow reflection, whether the friend likes butter or not? 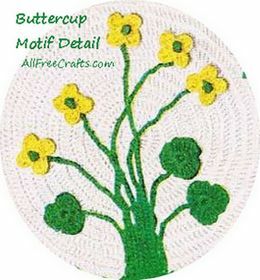 This buttercup pattern is part of a Crocheted Pot Holder Set pattern, which also includes poppy and grape motifs, but I think it would also look nice appliqued in an embroidery hoop or used to decorate other items. Please set the Crocheted Pot Holder Set page for comments on the thread used in this pattern (first published in the STAR POT HOLDER Book No. 101, in 1953). Buttercup, don’t break my heart. FLOWER: With Yellow, ch 5, join to form a ring, ch 1, s c in ring, ch 3, 2 tr c in same space, ch 3, * s c in same space, repeat from * twice, sl st in 1 s c, cut thread. Work 4 more flowers in same manner. With Green, ch 6, join to form ring, ch 1, s c in ring, * ch 3, 1 d c, 3 tr c, 1 d c, ch 3, s c in same space, repeat from * once, ch 3, 1 d c, 3 tr c, 1 d c in same space, ch 3, sl st in 1st s c, then work a chain about 2 inches long leaving a length for sewing, cut thread. Work 2nd leaf in same manner but work a chain 2½ inches long. Work a 3rd leaf with a chain about 1½ inches long. With Green, ch 2, d c in 2nd st from hook, sl st in same space (knot), then work a chain about 5½ inches long, cut thread, leaving a length for sewin. Pull this chain through the centr hole of flower with the knot on the outside. work 4 more stems in same manner making them different lengths. Sew flowers and leaves in position as illustrated. Shorten any excess length of stems.